It was around 3 years ago, I found a packet of 16 bean soup mix while doing some grocery shopping. The inspiration came from this post. It was very interesting to see so many types of beans in one packet. Since then, I have bought this very regularly. 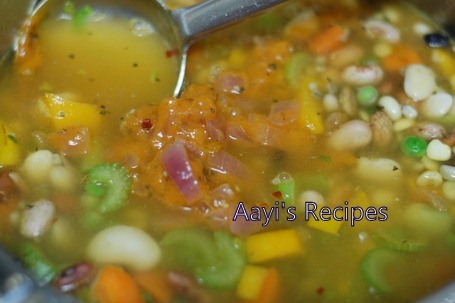 I have tried different combinations of veggies, sauces, spices in this soup. I make it for our lunch. This makes a very hearty and filling lunch. I have been down with very bad cold for more than 2 weeks now. So yesterday I made this. I thought I would note down recipe as this must be my favorite version so far. 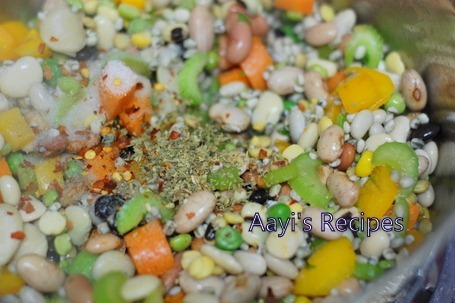 If you cannot find this soup mix, just mix all kinds of beans and dals – like red kidney beans(rajma), chickpeas, white navy beans, brown lentils, black eyed peas (alsande), dried peas(vatana), chana dal, etc, – you have at home. Cook 2 tomatoes and 1 carrot, chopped in big pieces, in water. Grind to a smooth paste. Heat oil and add 1/4 cup onion. Now add the ground paste, a little sugar(optional), salt, dried basil. Cook till the sauce becomes thick. (This sauce can also be used with spaghetti or any other pasta). Soak the beans in water overnight. They increase considerably in volume. Heat a little oil and fry the vegetables for 3-4mins. Now add the beans, barley, chilli flakes, basil, salt, pepper. Add the sauce. Add about 2 cups water. 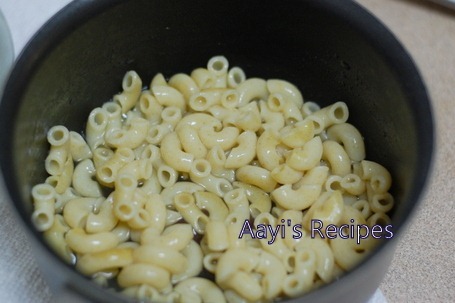 Cook till the beans are soft – I use either pressure cooker or rice cooker to cook this. You could also use a slow cooker if you have one. Separately, cook the pasta with salt. Add the pasta to the soup and cook it again for another 1-2mins. 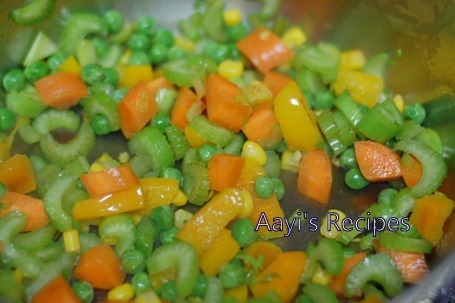 Very healthy and colourful recipe… thanks:-) At the end u have mentioned to add the paste and cook for a while.. is it paste or pasta? Pasta. Thanks for pointing. Have updated it now. 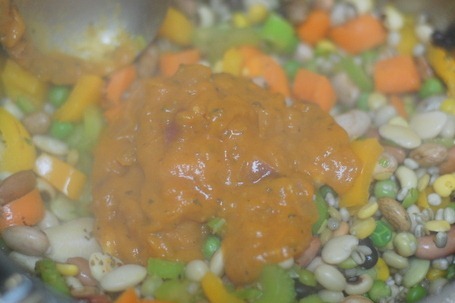 I make soup with 16 bean mix too. Looks yummy and filling with the pasta. 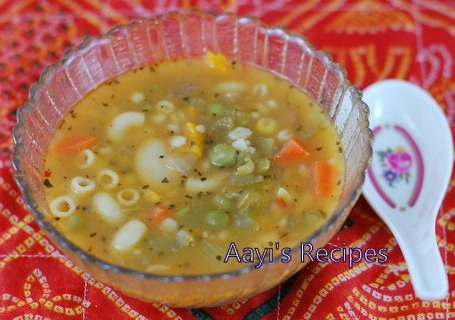 Very yummi Testy & Healthy soup. I just noticed the date. It was around 6 years ago!. Time flies. Can’t believe it. How have you been Linda? Very yummy. Did you find the 16 bean packet in the Indian grocery store ? I’ll try to buy over the weekend but not sure where I can look for it. Thanks for the recipe Shilpa. While storing the stock pasta paste in an air tight container, do we have to store this in the freezer/in the lower compartment of the fridge? For how long this paste can be stored? I just keep it in airtight container in fridge for couple of days or in freezer for 1 week. How long do we have to cook if using a slow cooker? I’ve used your work to learn some simple cooking. Your website title makes me emotional, as I am from Konkan and it reminds me of my mother, whom I’ve missed all these years. Besides culinary implications, your blog lands up doing very good social work. Congratulations! Below are links to Sarvangasana and Anulom Vilom (deep, alternate nostril breathing). I have been doing them for the last 4-5 years and havent had a single episode of cold or a blocked nostril. My post nasal drip issue got me into this and over time I’ve experienced several collateral benefits. http://www.youtube.com/watch?v=w8-WfV4-QU4 (focus and follow your breath as it travels all the way from head to abdomen and ensure you exhale deeply, feeling the hollowing in the abdomen). Reverse follows during inhale cycle. Practice at your own pace and leisure. Forget and discard nasal wipes forever. If you cant get links up, pl. email me and I shall respond.